“I wish you were a fun mum, like that lady,” lamented my seven-year-old son Louie recently. Yes, it struck like a dagger through my heart or, more appropriately, like a Lego block in the naked sole of my foot. Not that he’s a Lego man, mind you, he’s more of a Shopkin guy, and they’re not nice to step on, either. But nothing hurts like Lego, and this was definitely Lego level on the cruel-kid-comment spectrum. It was the last day of the school holidays and I felt I’d been more than generous in putting myself in hideous situations for his and his sister’s enjoyment. “I took you for a day at the snow, you had three play dates, I bought a fire pit from Bunnings so you could toast marshmallows without us having to go anywhere near a sleeping bag, I sat through Diary of a Wimpy Kid, and I watched the entire run of The Handmaid’s Tale on my phone so you could hog the big telly. I am heaps of fun!” I thundered. “Well … you realise we don’t actually have a trampoline,” was all I could muster, then I sulked off down the hall to steal some quiet wine time in the laundry. If there is one design flaw in humans, it’s our inability to comprehend simple good times while we’re living them. My son was born in Australia in 2009. He has so much food at his disposal he regularly requires two or three dinners be prepared before he decides which one he’ll eat (always the first one). My son has fresh clean jarmies to put on every night after he has had a warm, bubbly bath and been dried off by someone who loves him, who then mops up the buckets of water he has spilled on the floor. My son doesn’t know he broke my coccyx at the snow when he pulled me down hard on my backside to try to save himself. I haven’t told him because I don’t want him to feel bad. And my son has very nice parents! We taught him to walk, which frankly we didn’t have to do. If we weren’t nice people, we could have refused to hold his little hands and coax his little feet to flop in front of each other. If we weren’t nice people, we could have let him keep thinking it was possible for small boys to be consumed by vacuum cleaners (although he still thinks spiders will live in his hair if he doesn’t let me wash it – and please just go along with that if you bump into him anywhere). I sat in the laundry for a while that night, watching his little clothes swirl around in the dryer, cradling my wine in a Diary of a Wimpy Kid promotional plastic cup, and wondering why I bother trying to make my kids happy all the time when all they ever seem to feel about my parenting is disappointment. Then I considered my own childhood, and how I used to torment Mum about this one particular friend, who had a pet rabbit and a vinyl copy of Michael Jackson’s Thriller album. She had heaps of other cool stuff, too, all gifts from her dad, who lived with his new family in another state and never visited in the five years she and I were friends. Why can’t we understand in the moment? How come we can know when we’re scared, tired, angry, horny, hungry, excited, embarrassed and offended, but have no idea when we’re lucky? It’s a design flaw, a mistake, a glitch – and there should be a recall. I tell myself that one day my baby boy will get it. He’ll realise how lucky he was to experience an average Australian childhood in a world that sometimes seemed like it was going insane. I tell myself, too, as I sit alone in the laundry feeling sorry for myself, that I’m oblivious to the lucky little life that I’m living. 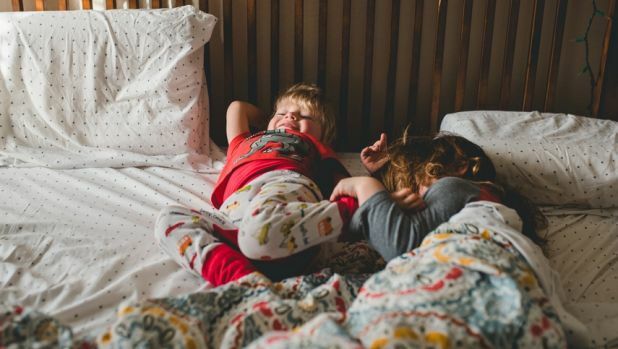 I have two children who are massive jerks at times – but they’re my jerks, and I’m sure the day will come when I’ll yearn to be able to walk up my hallway and see them nestled in front of the big telly in their flannel jarmies. I may even grow to miss the insults – but I will never, ever miss the Lego.